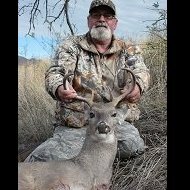 New Mexico Coues and Lion Pedestal for "Elkman"
Blood trail dog available for "rent"
Father and Sons...3 Bucks in 2 Days! Javelina with a Bad Attitude!! Wild Heritage Taxidermy 2013 competition piece.